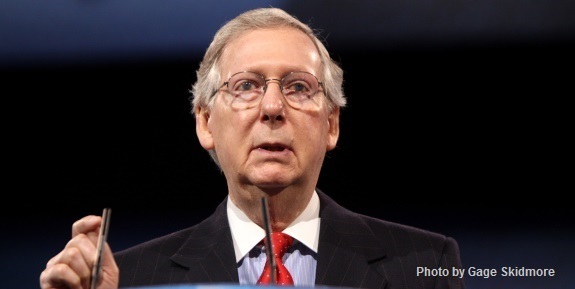 The Senate’s Republican Majority Leader, Mitch McConnell, has pulled back the promised Obamacare repeal vote until after the Independence Day recess – but has promised a new bill to send to the Congressional Budget Office by Friday. This may or may not be a sign that McConnell is moving closer to a bill that can garner at least 50 votes in the Senate, but it is certainly a sign that McConnell’s much-vaunted reputation as a master tactician of the Senate Rules is in tatters. The problem with the whole congressional Obamacare “repeal” effort is that it is based on the arcane Senate budget “reconciliation” rule, which gets around the Democrats’ filibuster threats by allowing a simple majority to pass the bill, rather than the 60 votes it would take to break a filibuster. However, “reconciliation,” being strictly a budget measure cannot reach many of Obamacare’s biggest problems and cost drivers, such as the regulations that are driving insurance companies out of the Obamacare market in state after state. All “reconciliation” can do is address budget issues, such as reducing the growth off Medicaid expansion. Naturally, if you put less money into the Medicaid system that Obamacare bloated beyond all recognition, this causes people to “loose” insurance coverage. Many of the people the Congressional Budget Office (CBO) says will “loose” health insurance are people who will simply choose not to buy it if they are not forced to do so by the individual mandate. So, it is not necessarily the reality of the bill that is the problem for the squishy left of the Senate Republican caucus – it is the way it looks. Not to repeal of Obamacare, that’s for sure. We think Laura Ingraham pretty well nailed it in a recent appearance on Fox. Submitted by rosugill on Thu, 06/29/2017 - 11:53. IMO, if they really want to reduce healthcare costs and have better healthcare, they need for the Government to have as little footprint as possible and they need to get rid of some stupid regulations. Health insurance should be able to be sold across state lines, people should be able to have and maintain tax exempt healthcare savings accounts,and about the only place the Government should come at all is they, in my mind, should create a pool for the very high risk patients that are sick and then the insurance companies and the Government should split the cost for those folks. To me, that sounds like a simple and effective way to accomplish what they are trying to do. Private enterprise carries the big majority of the load and the Government helps with one relative small though very expensive group. My bet is that they will come out with a great big monstrosity like Ovomitcare is with Government control of everything. Everything the government touches turns into feces, so there should be as little Government as possible. Submitted by email_registrat... on Fri, 06/30/2017 - 02:29. The idea of healthcare savings accounts is about as ignorantly conceived as it gets: Such an account works ONLY for those with substantial incomes, incomes large enough to afford to save thousands of dollars every year for the sole purpose of covering the medical expenses of even the slightest procedures, not to mention routing doctor visits, medication, etc. For working class folk, such a savings account is far out of reach. It amazes me how stupid this idea is. Even more amazing is that anyone with half a brain would actually suggest it. Submitted by Joseph C Moore-... on Thu, 06/29/2017 - 11:26. If the RINOs are not eliminated from the houses of congress, it will be (monkey) business as usual. The public has been lied to for decades and now have little hope as Trump (the supposed savior) seems to be accepting their destructive nonsense.